Yeah I know the signs actually work but it would be useful if you could see what enchantments were on the signs. Seeing as this mod allows viewing enchantments on normally non-enchantable items I was hoping that it would be easy to add in? Even though it doesn't say it on the sign, enchanting signs does work with Tim the Enchanter, which you need to apply enchantments without an enchanting table anyways. Or a similar plugin at least. 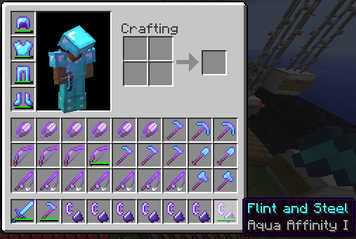 No idea if other enchanting plugins allow sign enchanting, but they probably do. Is there the possibility of adding signs? Any enchant to make the bow pullback firing speed less pathetic? But nice! I will use it if you can use an enchanting table with it, (and disable them) so please add those features!